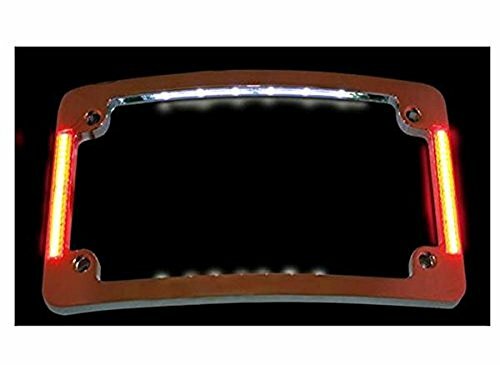 License plate frame with six bright white license plate LEDs. Flushmount run, brake and turn signal LEDs. 45 super bright flushmount dual-intensity red running/ brake LEDs. 20 super bright flushmount amber turn signal LEDs per side. Frame dimensions: 7 1/4in. L x 4 1/4in. W. Mounting holes center-to-center: 5 3/4in. x 2 13/16in. Available in flat and radius styles; radius has a 12 curve. Available in black and chrome finishes. Mounting hardware included.